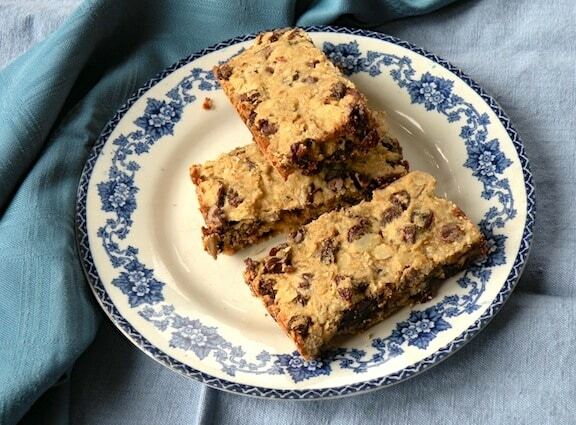 Here’s an easy-to-make vegan bar filled with chewy granola in a soft dough. 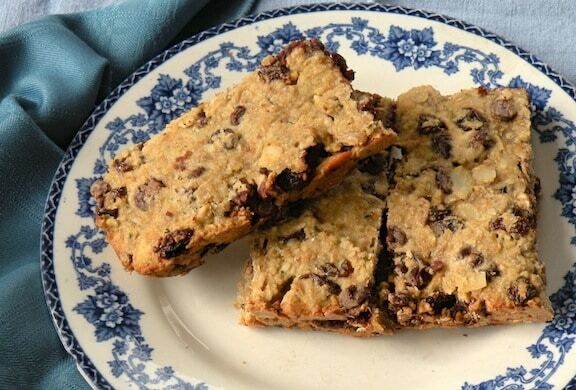 It’s a kind of a cross between a granola bar and a blondie bar. Perfect as a mid-afternoon snack with coffee or tea, an on-the-go breakfast, or to pack in the lunchbox. Adapted from The Vegetarian Family Cookbook. Combine the first 4 (dry) ingredient in a mixing bowl and stir together. Make a well in the center of the dry ingredients and pour in the applesauce and optional nut butter. Stir together until the wet and dry ingredients are completely mixed. It will be a stiff batter. Stir in the granola, raisins, and chocolate chips. Pour the batter into a lightly oiled 9- by 9-inch pan. Bake for 20 to 25 minutes, or until a knife inserted into the center tests clean (aside from the melted chocolate). Let cool completely in the pan, then cut into 8 bars. Please put the Calories and fat content. Irma, I don’t normally have the stats on hand, but this recipe happens to be from one of my books, The Vegetarian Family Cookbook. Per bar, if divided into 8 bars, it’s 175 calories and 6 grams of fat. when do you add the granola? it’s listed in the ingredients but not in the directions. Mar, thanks for the catch. I corrected it. Any substitutes for the applesauce? Jackie, yogurt (preferably nondairy) would result in the same texture. Can you put more of different types of seeds or raisins or maybe even ground oatmeal and still get the same texture? Kyla, that should work. Just make sure everything is moist, but not mushy! I tried these and they are really good. Personally, I’d like them a tad sweeter so I might add a little bit of honey or maple syrup but that is, of course, personal taste. Thank you for the great recipe!